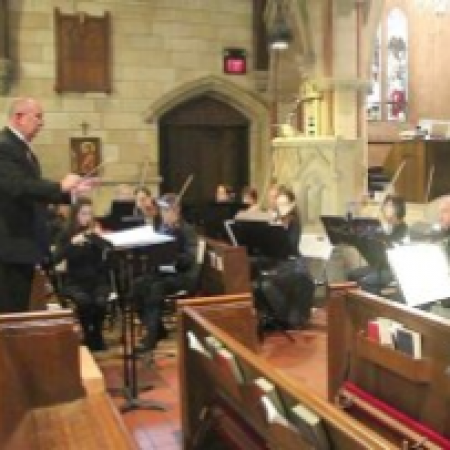 On Sunday, April 14th at 2:00 p.m. the 35-member Providence Chamber Orchestra will appear in concert at St. John’s. Featured soloists are Catherine Getchell, trumpet and Sam Getchell, trombone. Tom Snyder, Director of Music at St. John’s, serves as conductor of the ensemble which was founded in 1999 to meet the musical needs and aspirations of its members, a group of talented, amateur musicians from the greater Philadelphia area, all of whom share a common passion for playing music. The program includes Beethoven’s Egmont Overture, Concerto in Eb for Trumpet, by Franz Joseph Haydn featuring trumpeter Catherine Getchell, Aaron Copland’s Quiet City with trumpeter Catherine Getchell and trombonist Sam Getchell, and Mozart’s Symphony No. 40, K. 550. Catharine Getchell is the co-principal trumpet of the Edgewood Symphony, East Winds Symphonic Band and Unity Brass Quintet. Sam Getchell has performed with the Pittsburgh National Repertory Orchestra, New World Symphony, Tanglewood Music Center, Wheeling Symphony, Pittsburgh Ceremonial Brass, and Unity Brass Quintet. As we celebrate 20 years of music and friendship, you are invited to share our music making. A reception follows the concert.